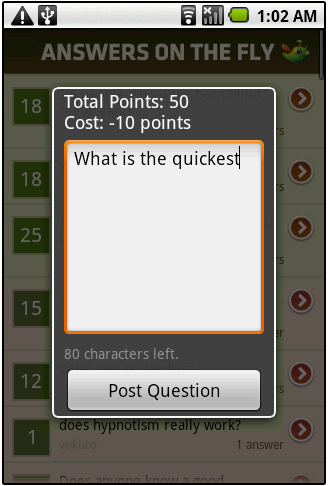 Answers on the Fly is a free mobile application for Android phones. Answers on the Fly lets you ask and answer questions from anywhere, as part of a mobile community. Get it FREE from the Android Market! Why should I use Answers on the Fly? Answers on the Fly lets you ask questions and get answers no matter where you are. Each question you ask goes straight to pockets of hundreds of mobile users - ensuring a fast response. People will be answering you from offices, cars, trains, etc! How do I get Answers on the Fly? The application can be downloaded free of charge from the Android Market. On which phones can I install Answers on the Fly? 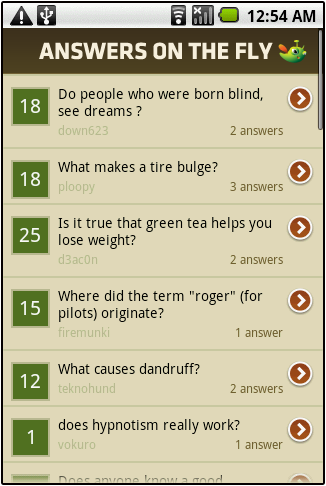 Answers on the Fly can be installed on any Android phone. Examples of such devices are: HTC Dream/G1, HTC Magic/MyTouch 3G, HTC Hero/G2 Touch, Motorola Droid, Samsung Moment/InstinctQ, Samsung Galaxy, HTC Tattoo/HTC Click, Motorola CLIQ, Huawei U8230/ Pulse. Copyright © 2010 Macrospecs, Inc.